Christmas begins way too soon, in my opinion… at least the commercial side of Yuletide. Even before time brought the lights down on Halloween, it seemed that retailers were prepping for their next big consumer event. I have a lot to say on the subject of retail’s abduction of this religious holiday, but I’ll keep that to myself for the moment. 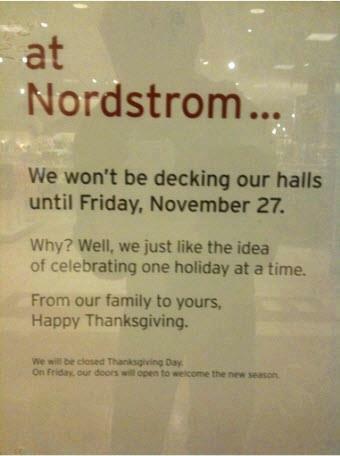 So, I was quite thankful to see this notice from Nordstrom on Facebook this morning. The department stores won’t begin their Christmas festivities until it is appropriate, which is after Thanksgiving. Apparently this is not the first year they’ve done this, and that is even better news. It shows that not only are they committed to this, it also must have worked for them. If there was any impact to not dragging out the faux-fir greenery and decking their aisles with tinsely delights before the “offical” beginning of the December holiday season, it must not have been much. Perhaps it worked in their favor. At any rate, it’s a great move. If there is any holiday that deserves America’s attention, it’s Thanksgiving. And with retailers pushing Christmas wares in late-October and early-November, it’s as if they are trying to diminish its importance. Sure, it doesn’t contribute to the bottom line for most of them. 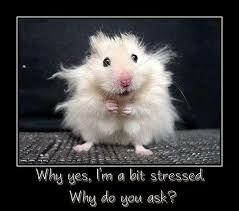 But, it still exists. 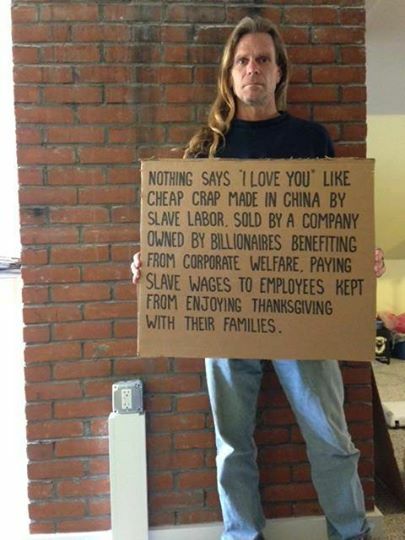 And without it, when would their precious Black Friday take place? Thank you, Nordstrom… an any other corporation willing to stick with tradition and keep Christmas commercialization contained.